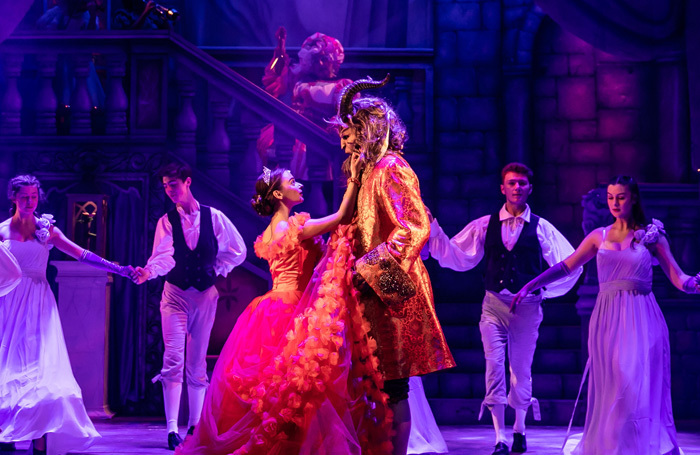 Theatre Royal Winchester’s Beauty and the Beast might not have the most glittering sets or the greatest number of costume changes but it is big on heart. It’s a very traditional pantomime complete with entrances by good and evil, a satisfyingly messy slosh scene, a riotous song-sheet, plenty of audience participation, and a marvellous fart joke – with a really good story to drive it all along. It’s charmingly old-fashioned and there’s nothing wrong with that. Eleanor Bennett’s elfin Belle oozes no-nonsense intelligence and is more than a match for Kristopher Milnes’ self-regarding suitor Bouffon, he of the magnificent quiff and impressive six-pack. Nathan Turner’s Beast has a sweet naivety when it comes to wooing Belle and the moment he realises Belle has abandoned him has genuine pathos. Alice Bonifacio’s fiddle-playing Fairy Fifi and Sarah Annakin’s sassy Malevolent bounce off each other nicely and there’s enthusiastic support from Tim Faulkner as Belle’s father. Theatre Royal Winchester’s regular dame Julian Eardley is the Beast’s housekeeper Dotty, all bright blue eyeshadow and double entendres, and an energetic Ed Thorpe as Dotty’s daft nephew Wally has the kids onside from his first appearance. This is writer and director James Barry’s 14th consecutive TRW panto and he clearly knows what works. Composer Simon Slater produces some catchy songs (with Barry providing the witty lyrics) and musical director Tom Attwood ensures it all sounds perfect.